Chilli mussels are an year round dish - they work great in summer with some beers outside, but they are also a warming winter comfort food. 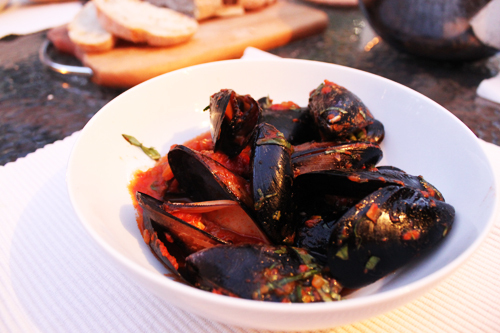 There are so many variations to chilli mussels – thick tomato sauce, light Asian broth, steamed chilli mussels, with white wine, red wine, lemon, herbs, the list goes on. I prefer a simple tomato sauce, not to thick and chunky, not too runny, but ‘soupy’ enough to soak a crunchy piece bread in. I have written in the recipe to use a tomato passata – this is fresh tomatoes that have puréed into a smooth consistency. My family make their own passata every year, so I haven’t ever used a store bought one, but I would recommend trying to avoid any with added herbs, salt etc. Simmering times will differ from pot to pot. When ready the sauce should have a silky texture, and the tomatoes should no longer be acidic. 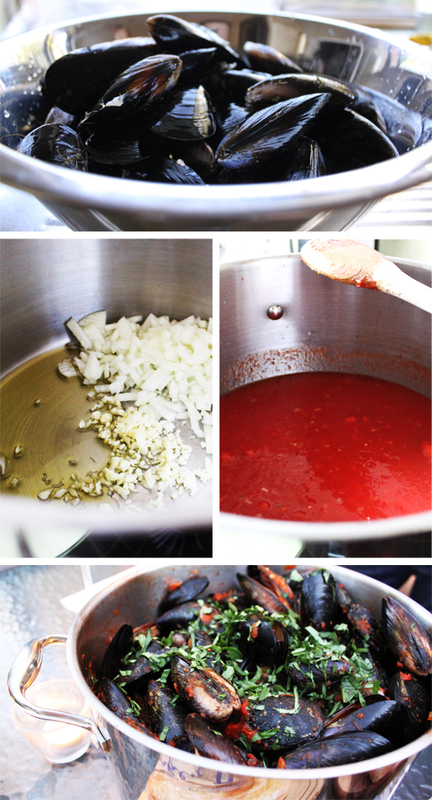 Don’t be tempted to add salt - the water from the mussels with season the sauce. Don’t try and open closed mussels – these are dead and shouldn’t be eaten. If you like more chilli, garlic, oil, herbs, add them. 3kg was plenty for 4 people; however there were a couple of other dishes consumed before the mussels, so 4kg could have worked too. In a large pot, sauté the garlic, onion and chilli with a good splash of olive oil. When the onion becomes translucent, add the tin of tomatoes and the passata. Fill the tin up half way with water and add to the pot. Bring to the boil and cook on high for 10 minutes. After 10 minutes, reduce the sauce to a simmer and cook uncovered for 20-30 minutes, until the acidity of the sauce is gone and you have a nice smooth sauce. Add the mussels to the pot, give them a little stir and cover. Give the pot a shake every now and then to get the mussels opening. When all the mussel shells are open, they are cooked. Add the basil and mix through well. Serve with some fresh bread.